When setting up a Malawi tank, the most exciting and confusing part is always choosing the fish. You may be tempted to go straight to the local fish store, grab one Malawi of every colour possible and throw them in your tank. The best thing to do is to join a forum, ask fishkeepers what’s best for your taste and tank, find a good breeder and purchase quality fish from them. Of course, everyone has different tastes: what one person likes someone else may not. 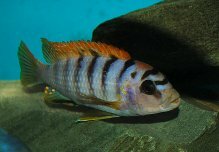 However, I have picked 5 Malawi mbuna that are colourful, entertaining, relatively easy to look after and are compatible together. Description: One of the most popular and commonly kept African Cichlid species. They are usually calm and easy to keep with other African Cichlids. The species is characterised by a bright yellow colour with a stark contrast of a black stripe on the dorsal fin. Breeding Information: Maternal mouthbrooders. 1 male to 2 females ratio is recommended. Sexing Information: Monomorphic, but males may show more bright colours, with moreblack on the fins. Description: Very vibrant colours, hence its popularity. They are different to other mbuna, in that they don’t dwell in rocks so much, and are great to have in mbuna tanks as they will often occupy the top half of the tank. The purple body and yellow tail of this fish makes it a very attractive choice. Breeding Information: Maternal mouthbrooders. Ratio of 1 male to 2 females is recommended. Sexing Information: Monomorphic, but again, males tend to be brighter in colour. 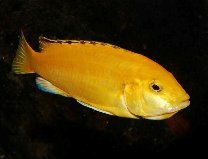 Hongi - Labidochromis sp. "Hongi"
Description: Males will defend their territory aggressively. They are one of the bigger mbuna, and the tank size should reflect this when deciding whether to choose this fish or similar. Minimum Tank Size: 60 gallons. Breeding Information: Maternal mouthbrooder. Males should have 2 or 3 females each. Sexing Information: Dimorphic. Males have a light blue body with dark vertical bars. Their dorsal fins may be light orange. Subdominant males and females are brown-purple. Minimum Tank Size: 40 gallons. Breeding Information: Maternal Mouthbrooder. 3 females per male is recommended. Sexing Information: Dimorphic. Males are deep blue with black vertical bars; females are a deep yellow. Description: My favourite mbuna: small; entertaining; colourful. These have cracking character that is matched by the males’ startling colour. They can be quite aggressive at times, and it is advised that they are not mixed with other Afras as the chances of hybridisation are high. Breeding Information: Maternal mouthbrooders. Ratio of 1 male for 2 females is recommended. Will hybridise with other Afras readily. Sexing Information: Dimorphic. Males are characterised by light blue and black vertical stripes with yellow fins, whilst females are brown. These are only five of the hundreds of Malawi Cichlids, that vary in size, shape, colour, pattern and behaviour. There are many other mbuna that are great fish to keep and are easy for the new Malawi keeper. For a greater variety of recommendations, join a forum and ask the experienced members and breeders for help and advice for what fish to put in your first Malawi tank, which will keep you hooked for a long time.